I am a fashion blogger. By mere definition, I should spend a majority of my time explaining the latest trends to you in some (hopefully) inspiring or palatable way. However, what if I told you I am currently in a place that has me wanting to totally abandon the latest trends? To many, this may seem a bit silly. I mean, what would I talk about on this blog if I wasn’t partaking in the latest trends? The answer: Anything I want to. You see, I believe this as an opportunity, not a hindrance. Instead of being limited to the latest trends, I have a whole world of ideas, outfits and inspiration that I can share that span far beyond the borders of the current season’s latest offerings. In today’s post, I am donning a look that doesn’t incorporate any of the latest trends. 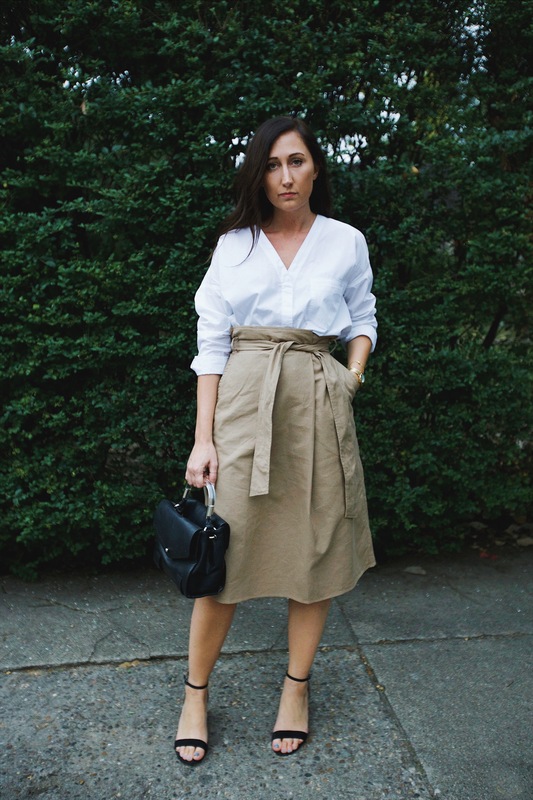 It simply boasts a few of my favorite staples: the perfect button down, a midi skirt and a minimal pair of black heels.